Fulbright scholar and Entrée to Black Paris intern Sonita Moss is conducting follow-up interviews with several of the women featured in our Black Paris Profiles™ interview series. Today's article features Nicole Pembrook. “Hustle and heart” should be Nicole Pembrook’s middle name. In part because she is all-in when it comes to expanding and promoting her craft, but also because she emanates warmth. Beyond life in Paris as a highly-sought after stylist, I am excited to hear her discuss parenting two Black children in the City of Light. In our hour-long conversation, I find out what Nicole has been up to since she was last featured in the Entrée to Black Paris blog. She continues to ascend. I’ve fallen back in love with Paris many times. So much to do, so many places to see. There is great food and great wine. It’s a constant discovery to live in Paris, and I love it. It’s one of the most beautiful cities in the world. As a young black male, I thought it was important for him to have a cultural experience. Initially he was worried, but I was able to break down that barrier by explaining that [there are a lot of amenities in Paris] but there is much more for you to learn by being there… All of the Africans I met always had a certain amount of pride, respect, hard workers. My children are resilient. The geographic proximity of the Loire Valley allows Nicole’s daughter to come back to the city every weekend. When she is not caring for her children, Nicole is developing her business model. She closed her Polished Hair Care salon on the Champs Elysées and now works as a stylist at Salon Konfidentiel, which is located at 267, rue Saint-Honoré, near Place Vendôme. I needed more time to develop Nicole Pembrook. Salon Konfidentiel is very one-on-one. I still enjoy a more cozy atmosphere, very convivial environment. It all depends on who you’re sharing your space with. I think that’s a huge factor. I always advocated a certain harmony among my staff. My girls are warm and welcoming. The owner has a specific service. We have a full esthetician and that’s been great for clients to bounce from me to this woman. There’s also no competition, we’re all bringing something to the table. Everyone has been low key and laid back. It’s been powerful to collaborate together. They say you attract what you are, so I do have a large African or African American and Arab clientele. But what’s also great is that a lot of white Americans find me. The Caucasian clientele has been steadily developing over the last couple of years. 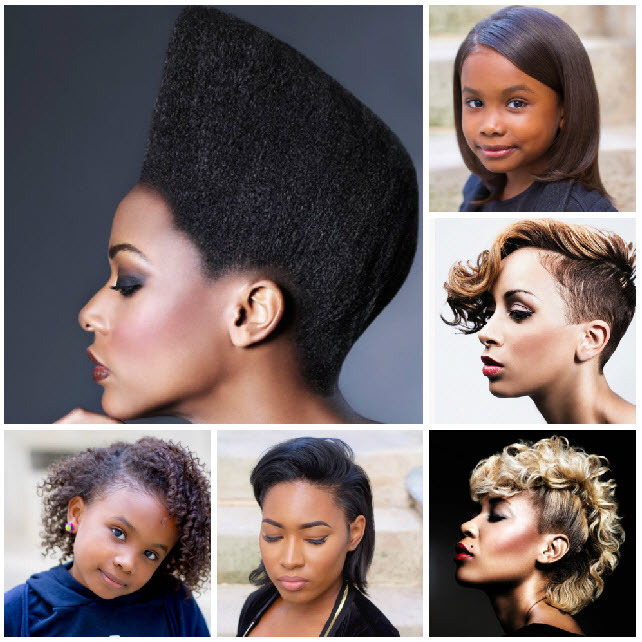 What has shifted is the orientation toward natural hair, a popular movement among Black women in the U.S. and beyond where, rather than relaxing or “perming” their hair, these women are embracing their texture and experimenting with other styles. 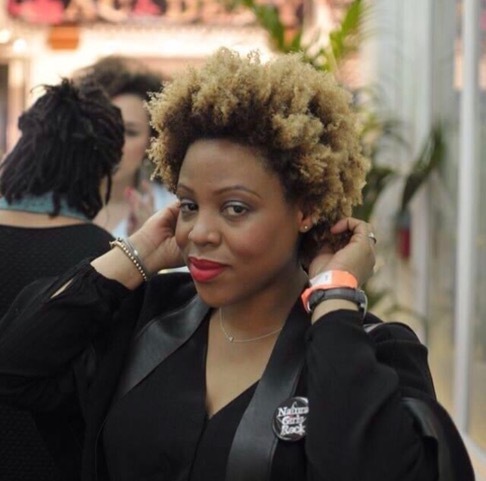 I think we’re at 60% and climbing at women who have natural hair [in my clientele]. I think there are a lot of different reasons for different women. Some women have to leave their hair alone because of the weaves and braids, and how it’s made their hair break off. 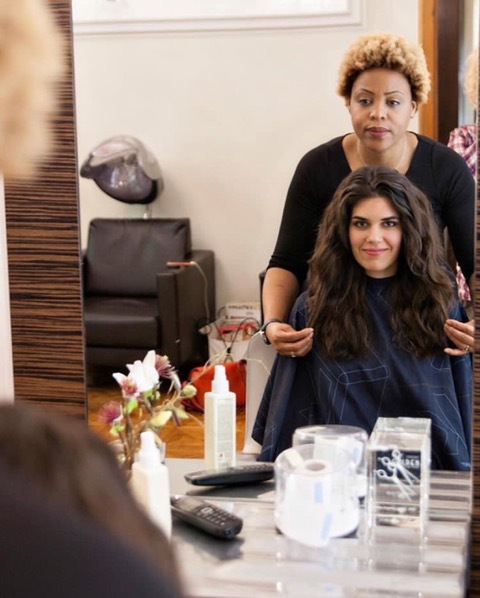 Some women don’t want to spend a lot of time in the salon because it can be time-consuming. It’s all connected because eating healthy and working out has become a lifestyle – natural is the way to go. It helps you have more leisure time. You learn what your hair is like. It’s about defying traditional beauty laws and accepting how God made us. Yeah, bottom line, we know we live in a sexist society where women aren’t taken as seriously as men. It’s a trip – even within the hair industry – the people with the most recognition are guys. There are so many names, and the list goes on and on and on. As women we’re always breaking barriers – especially with the internet, it makes it a lot easier today than maybe in the last 10 or 15 years ago. I’m developing a luxury wig line with lace fronts that resemble natural texture. I’m also doing master classes – I’m teaching clients on everyday maintenance on haircare at home. Women are not very well-versed in taking care of their hair. I have four classes: sleek and chic, happy and nappy, straight hair don’t care, destiny’s hair child (mother-daughter classes). I’m also wearing protective styling – I’ve been wearing full lace front wigs, to see how much growth I can have in a year. Nicole’s optimism is infectious. It’s clear that the only way is up, and after our conversation, I am eager to pay a visit to her salon.